Who says Stevo ain’t full of vim, vigour and vitality? 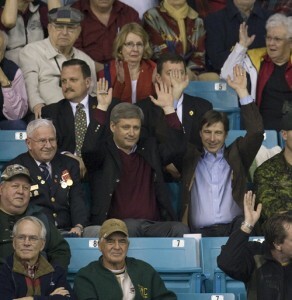 Prime Minister Stephen Harper and New Brunswick Premier Shawn Graham raise their arms during a human wave at the World Men’s Curling Championships in Moncton on Wednesday. Wow. Look at how enthused he is. Wow. My name is Stephen and I have to pretend like I’m enjoying this. Again, further evidence to support my 5 year old’s contention that our PM is a robot.